Determination of the causes of the Permian -Triassic boundary(PTB) biotic crisis is hindered primarily by the diachronous nature ofthe used PTB, poor stratigraphic control of compared Upper Permianand Lower Triassic faunas, espec ially in cont inental biotopes, poorknowledge of the lower and middle Scythian faunas from m,UlY environments, and by interpolation of the unknown (lower and middle)Scythian diversity from the known Upper Pennian and Middle Triassicdiversity data in many major fossil gro ups. Most of these problemscan be reso lved by using the firs t appearance datum (FAD) ofNil1deodlls pan'Ii,I' as either an isochronous PTB, or as an isochronousmarker [eve I very dose 10 lhe base of lhe Triassi c; careful studies offossil-rich, comp[ele conlinental boundary sections (e.g., Dalongkouin Sinkiang), and uti li sation of uninterpoJated diversity data, whichare based on known Scythian data, for the reconstruction of theextinction and recovery patterns in all fossil groups.The most important features of the PTB biotic crisis arc: (I)Among the marine biota, only the plankton and the wann-water benthos,nektobenthos and nekton are strongly affected by the PTB bioticcrisis. (2) The recovery of the warm-water nekton and nektobenthoswas very fast (after one conodont zone). 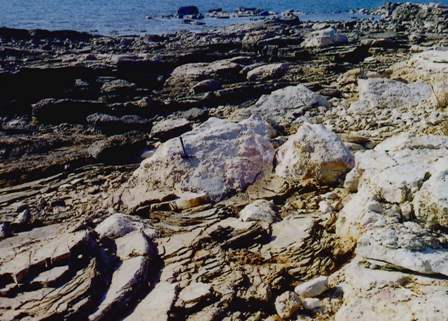 The recovery of the warmwaterbenthos, some of the plankton (radiolarians) and the terrestrialplant product ivity was strongly delayed for several million years, andoccurred on ly in the upper Ol enekian (upper Scythian) and in theMiddle Triassic. (3) The number of the Lazarus taxa that re-appearedin the upper Olenekian and above all in the Middle Triassic, is veryhigh (about 50%) and in some fossi l groups 90-100% at generic level.The reconstruction of the scenario for the PTB biotic crisisrequires not only the conside'rlItion of the uninterpolaled extinctionand recovery patterns of all foss il groups across all envi ronments, butmust also account for the main feat ures of geological evolution fromthe Middle Permian to the Lower Triassic. The most important causalfactors in the PTB biotic crisis are the ex tinction event at theGuadalupian-Lopingian boundary that restricted the diverse UpperPermian wann-water benthos 10 the Tet hyan shelves, the long-[asling,widespread Siberian Trap volcanism (Dzhulfian - lower Scythian)which was Ihe grealest volcanic event during the Phanerozoic, and (hevery strong explosive felsic 10 intermediate volcanism around thePTB, close to the margin between eastern Tethys and Panlhalassa.These volcanic activities resulted in those climatic changes that weredircclly and indireclly (as cause of the oceanic sll peranoxia) responsi blefor the PTB biotic crisis, such as periodic cooling of Ihe climateby volcanic dust and sulphate aerosols (mai nly caused by the SiberianTrap volcanism), acid rain, a 3-6 month "vo[canic winter" at low lat iIlldesand Ihe strongly reduced inpul of sunl ight during the uppennostDorashamian (both caused by lhe very strong explosive volcanism atthe Tethys/Panthalassa margin), followed by global warming in thelower Scythian, and uppennost Dorashamian to lower Scylhian superanoxia.